While some lights come with adjustable cables and rods - others don't! To ensure your light fixtures are at the proper height, keep the following measurement in mind: the bottom of the light should hang approximately 12 to 20 inches below a standard 8-foot ceiling – and, for each additional foot of ceiling height, add three inches. Chances are, you'll be hanging a light fixture above your kitchen table or island. How far should the light fixture be from the table surface? Design professionals recommend the following measurement: 28 to 34 inches from the bottom of the light to the surface of the table or kitchen island. Of course, these measurements do depend on the size of the fixture. In general, keep in mind that a smaller light can be lower, and a larger light can be higher. Are you building a new home? From start to finish? If so, consider the lighting you want in your home during the initial design phase. It is important to decide what you want before construction starts, as once construction starts it may be too late to make changes! If updating your lighting is part of your renovation, and you don't want a huge expense or hassle, consider cord swags. Basically, you can just swag the cord loosely over the bar or hook, or secure the cord tight to the ceiling for an industrial look. Lighting doesn’t always have to angle down. 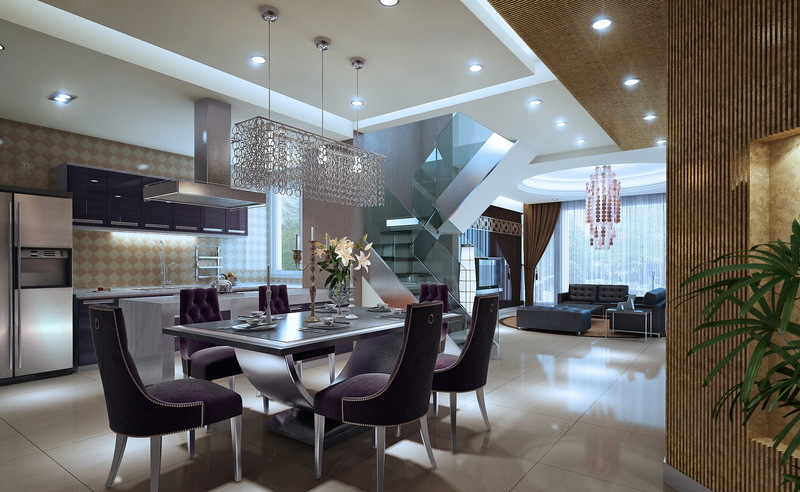 In fact, upward lighting can create a softer ambiance to certain locations within the home. Different light bulbs give off a different glow. Typically, those glows range from warm to cool hues. Is the light bulb that important to the overall lighting of your home? Yes, of course! Just like the color of your décor, each individual prefers either a warm or cool hue. If you don't know which option you prefer, here is a tip from the professionals: if your home's décor is mainly cooler tones, consider choosing the warm hue – as it will warm up the space. Of course, the opposite is true, too. If your home's décor is predominately warmer colors, consider the cooler hue to brighten up the darker space. Why light your stairway? Other than the obvious reason of preventing a potentially dangerous situation at night, lighting your stairway can add a unique design element to your staircase. Where do you add them? You can add lights to the risers or, if your stairway is enclosed, you can add them from the sides. Do you have upper cabinets? If so, consider adding some lighting below to brighten up the kitchen and the counter space. This lighting also looks gorgeous at night. Colored lights and pendants can add visual interest and fun to a room. If you have an isolated island in your kitchen, consider adding three colored pendants above. Not only will these create great lighting, but they will also add interest and a “pop” of color to your kitchen. These tips will ensure a well-lighted home. Do you have any questions about adding any of these lighting ideas to your home? Reach out anytime; I am always available.